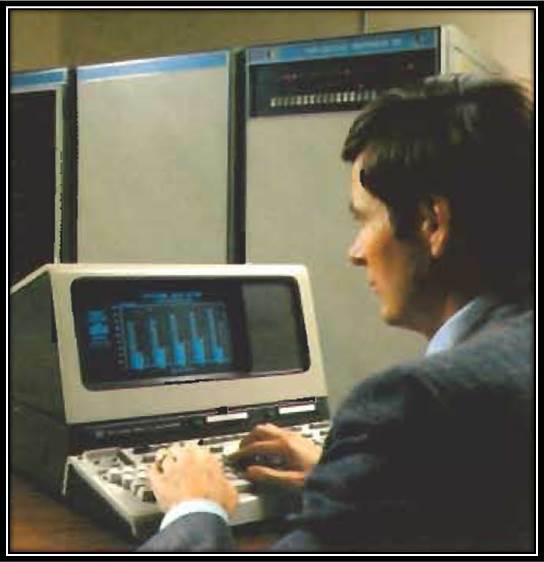 The top of the line end-user product for the 264X series was the 2647A Intelligent Graphics Terminal. It made its debut in May 1978 and listed for $8300. 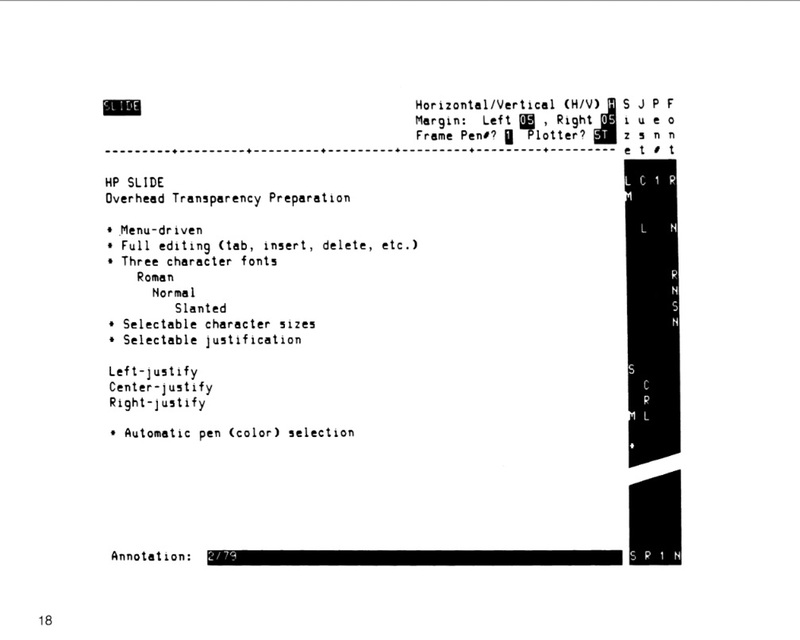 It came with a BASIC interpreter, a Multiplot program for creating line, bar, and pie charts, and an HP Slide program for making text-based overhead transparencies using an HP plotter. Incredibly slick technology for its day, but for those of us now accustomed to projecting powerpoint slides from a laptop, it’s hard to imagine the number of hours and manual attention it used to take to create a 30-page slide deck when you had to align each single transparency on a plotter, start the 4- or 8-pen plotting action, remove the plotted transparency, and then wait for it to fully dry before inserting it into a 3-hole sleeve. 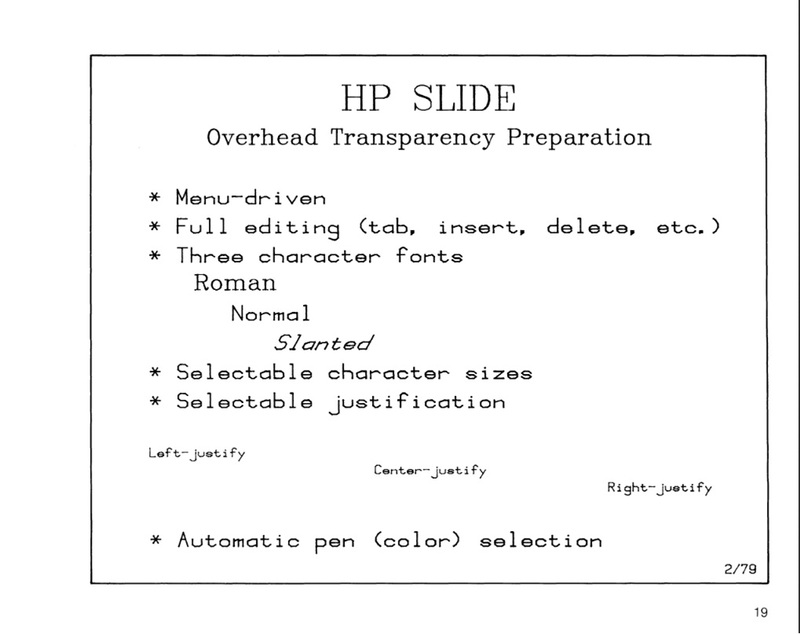 I’m sure I plotted hundreds of slides in my early years at HP. Here’s a diagram of the input screen for HP Slide followed by a sample of the plotted output from that screen. Notice on the input screen, there was a column labeled “Pen#.” This was the function that allowed text to be in different colors. Though you could arrange the plotter pens in any order, it was typical to put the black pen in the #1 spot, the red in the #2 spot, the blue in the #3 spot, and the green in the #4 spot. In the example shown below, only pen #1 is used.